"We wish we'd stayed for longer!" Whether you are visiting us as part of a once-in-a-lifetime holiday tour, or treating yourself to a special short break in this beautiful part of New Zealand, Manakau Lodge is the perfect base from which to explore Kaikoura, enjoy our world-class marine excursions, sample seafood delicacies in our local restaurants, or simply relax and unwind in the peace and quiet of our country surroundings. 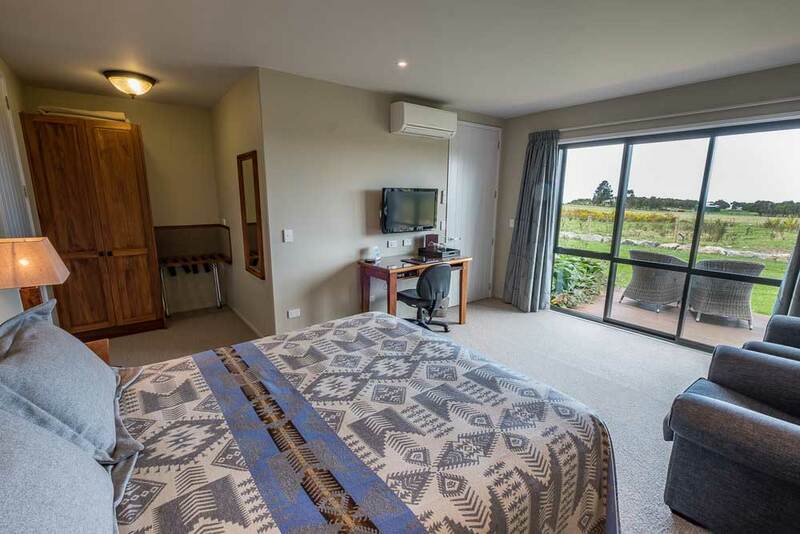 If you’re searching for accommodation that offers the warm, friendly, Kiwi hospitality of a B&B, with the style and comfort of a boutique hotel, then we look forward to welcoming you to Manakau Lodge. Our guests’ comfort is our number one priority. Our four purpose-built private guest rooms are spacious, elegantly appointed, and feel like a home away from home. A great night’s sleep awaits in our specially-chosen, super-comfortable pillow-top beds, with fine cotton linens and luxurious Pendleton® woollen bed blankets. Our furnishings are hand-made from New Zealand rimu, a native timber prized for its warm tones and rich natural beauty. For relaxation we provide a pair of deep-cushioned armchairs and a writing desk with an ergonomic chair. For entertainment, a state-of-the-art, internet-connected 43in 4K HD Smart television and a huge music and movie library streamed on demand by Apple® TV. Also installed and connected to the TV is a Yamaha Soundbar to which guests can connect their own devices via Bluetooth, and enjoy room-filling surround sound. An in-room iPad offers complimentary internet access at your fingertips, and USB power points are conveniently positioned for charging your own portable electronic devices. Each room is ensuite, fully self-contained and individually air-conditioned for comfort. Manakau Lodge Room 1 has a king size bed, an outdoor deck with patio chairs and a granite picnic table. It offers beautiful panoramic views over unspoilt New Zealand countryside to the ocean, especially at sunrise. On clear nights, the stars in the sky will take your breath away. A contemporary-design ensuite bathroom with huge walk-in monsoon shower, heated floor and towel rail, automatic mirror de-mister, luxury toiletries and soft velour bathrobes provide the added luxury you want for your luxury South Island experience. Manakau Lodge Room 3 has a super-king bed which will convert to twin single configuration if required. The outdoor garden deck has two patio chairs and a granite picnic table, perfect for enjoying a coffee in the morning sunshine. The stylish luxury ensuite bathroom has a free-standing bath tub, a huge walk-in monsoon shower, heated floor and towel rail, automatic mirror de-mister, luxury toiletries and soft velour bathrobes. Beautiful panoramic views over unspoilt countryside to the ocean, especially at sunrise, and on clear nights, the stars in the sky will take your breath away. Manakau Lodge Room 2 has a king size bed, an outdoor deck with patio chairs and a granite picnic table, a contemporary-design ensuite bathroom with huge walk-in monsoon shower, heated floor and towel rail, automatic mirror de-mister, luxury toiletries and soft velour bathrobes. Views of the Seaward Kaikoura Range behind us are unrivalled, and our landscaped garden, stocked with a variety of native plants, also attracts a variety of birdlife in spring and summer. Relax and enjoy our beautiful surroundings. Manakau Lodge Room 4 has a super-king bed which will convert to twin single configuration if required. The outdoor garden deck has two patio chairs and a granite picnic table, perfect for enjoying a glass of wine in the afternoon sunshine. The stylish luxury ensuite bathroom has a free-standing bath tub, a huge walk-in monsoon shower, heated floor and towel rail, automatic mirror de-mister, luxury toiletries and soft velour bathrobes. With superb mountain views, enjoy the comings and goings of our garden birds, and you can even see the ocean through the bedside window, too. Breakfast at Manakau Lodge is a relaxed, leisurely and civilised affair. Our breakfast menu offers a great choice of freshly-prepared favourites and traditional dishes to suit all tastes. We use only the freshest, highest quality ingredients available to us, all prepared and cooked to order. For guests booked on an early-morning marine excursion or with an early start to their onward journey, we can offer a breakfast-to-go of fresh fruits, yoghurt, muffins, fruit juice and coffee. Breakfast is served at the time of your choosing, in the comfort of our dining room. The perfect start to the day! For guests not wishing to drive to town for dinner, we offer a platter of artisan cheeses and fresh fruits, accompanied by first class New Zealand wines served by the carafe or bottle. Served outside on your room deck, this is an ideal option for those who may enjoy a more substantial lunch in town during the day and a relaxed, leisurely evening at the Lodge.